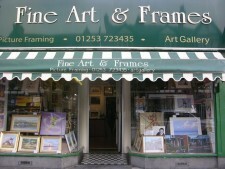 Fine Art & Frames is proud to be one of the only local, independent framing shops in the Fylde area. We specialise in creating bespoke frames and we also display and sell local artwork, prints and decorative ornaments for you to browse in-store. If you have any queries there is always an experienced member of staff on hand to help you with friendly and constructive advice. Situated in the heart of St Annes, proud proprietor Julie McLellan provides a friendly and professional service to help you buy, display and care for your artwork. With years of experience in the industry, Julie and her team strive for high standards to ensure that your experience in the shop is unique. All works are handled with the utmost care and our bespoke framing service includes a wide range of styles and materials that will complement both the artwork we sell in-store as well as any of your own pieces that you wish to frame. With both modern and traditional frame mouldings and an array of mounts, each frame is individually tailored to your artwork and is created on-site. Whether it’s a box frame or a swept frame, sports or military memorabilia, tapestry, cross stitch or canvas stretching, we can accommodate your budget and your framing requirements. All of the artwork displayed in-store is sourced from local artists, print companies and publishers. All of the artists represented have a highly successful association with Fine Art & Frames and have exhibited both in the UK and in Europe. Julie also collaborates with skilled, local wood turners and glass sculptors and displays the newest of their collections. The shop is also looking to grow its online presence in 2019 via social media marketing campaigns and e-commerce selling. Please visit our sales page and follow us on Facebook, Twitter and Instagram to keep updated on our new stock, upcoming events, our favourite professional and amateur artworks and our competition giveaways.